On January 22, 2019, the White Frigate moored in the Panama Port. Here, Poland’s concert for Panama will be held, inaugurating the World Youth Days 2019. The event will be preceded by a solemn Holy Mass with the participation of the Primate of Poland Archbishop Wojciech Polak and Polish bishops, youth of Independence Sail and pilgrims. 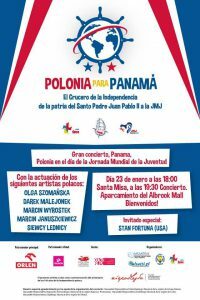 After the Holy Mass a concert of Polish and Panamanian artists will begin. World Youth Days in Panama will last until January 28, 2019.